RenderHogs aims to make heavy comps more responsive by disabling any unecessary layers/effects until render time. This is achieved by allowing you to tag resource intensive layers and effects in your comp. They can be toggled on/off at the click of a button, and you can also tag substitute layers/effects that serve as stand-ins while the hogs have been disabled. 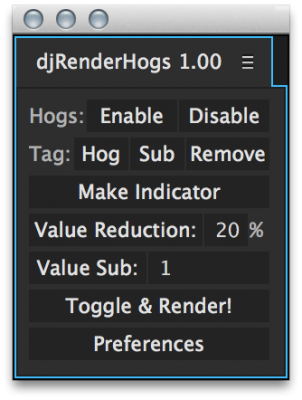 In addition to tagging layers/effects, RenderHogs can setup special expressions that alter the value of any keyframeable property based on whether the hogs are enabled or disabled. Enable and disable all tagged render hogs instantly throughout your entire After Effects project with a single click. Any layers/effects tagged as substitutes will do the opposite, allowing them to serve as stand-ins for the layers/effects that were marked as hogs. 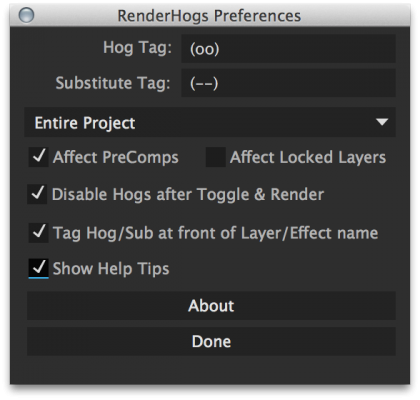 The tag buttons allow you to mark hogs and substitutes as well as remove any existing tags from layers/effects. The tag buttons are context sensitive. RenderHogs can generate a layer that acts as a visual indicator in your composition, alerting you when the render hogs have been disabled. This indicator acts as a safeguard agaist producing renders that are missing essential layers/effects. This command produces a special expression that takes the value of a selected property and reduces it down to a specified percentage. The big advantage in doing this is it allows you to still have some representation of your effect, rather than disabling it completely. One example of this would be if you have a particle emitter that is producing 100,000 particles per second. Using the Value Reduction command, you could reduce the value down to 20%, meaning the emitter would only produce 20,000 particles per second when the render hogs have been disabled. If keyframes are used, the Value Reduction expression will produce 20% of the keyframed value without actually affecting the original values of the keyframes. This is similar to the Value Reduction command in that it changes the value of a selected property based on if the hogs are enabled or disabled. Instead of reducing the value by a percentage, it allows you to specify a completely different value. An example of this would be if you had a Radial Blur effect, you could have the Antialiasing property set to "High" when the hogs are enabled. Upon disabling the hogs, you could have the value change to "Low" to help keep the comp more responsive. This command allows you to instantly enable all render hogs and begin rendering. If you're using the QueueMaster script, it can automatically enable all hogs and disable all substitutes while automating renders. QueueMaster is a powerful way to automate the render queue in After Effects. RenderHogs includes a collection of mini-scripts that provide the ability to execute certain commands via launcher scripts. Mac OS users can even assign hot-keys via the Keyboard preference pane in the system preferences. Before purchasing RenderHogs, please download the trial to ensure it suits your needs. The trial is fully functioning for 15 days. There's a bug involving expressions that affects Mac OS versions of After Effects. Adding/removing tags to layers/effects that are referenced by expressions sometimes causes the expressions to become broken. Adobe has been contacted regarding this bug. Please don't hesitate to open a support ticket if you'd like to submit feedback, ask questions, or request additional features for RenderHogs. Professional stereoscopic workflow tools enable you to create mind blowing stereoscopic animation in After Effects. Automatically generates true left and right channels, and Stereo 3D Pre-Comps. Compatible with all your favorite After Effects Plug-ins. Increases your render time so you can take a longer break.